Talo sijaitsee Hamlet nimeltään "Los Llanos" erittäin rauhallisella 0. 5 km. Kylästä Fataga. Kylä sijaitsee laaksossa korkeudessa 600 m., With leuto ilmasto suurimman osan vuotta, ympäröivät vuoret, jonka suurin korkeus on 1100 metriä. etäisyydellä vain 18 km. päässä Playa del Ingles. Se on karu maisema erilaisia ​​kasvistoa ja Kanarian macaronesic eläimistöä. Valley on maksimipituus 10 km. Ja keskimääräinen leveys on 2 km. Siellä lukuisia polkuja retkeilyyn kiivetä jopa 1000 metriä. tall keskityksiä etelästä pohjoiseen, johtava tie Tejeda ja korkein kohta saarella (rinnat) ja korkeudessa 1956 metriä. ja etäisyydellä 40 km. päässä Fataga. Se on myös terveyspalvelut (3 päivää viikossa), supermarket, huoltoasema, kolme ravintolaa ja pankkiautomaatti. Ystävät voivat harjoitella kiipeilyä Fataga Dam 5 minuutin päässä kaupungista. Ilmastointi. Ensiapulaukku. Electric kahvinkeitin. Turvallisia. Cradle lakanat. Sähköuuni. Pesin. Astianpesukone. Lingerie täydellinen mukaan varauksen. Astiat. Silitysrauta. Kuivausrumpu. TV Astra satelliitti. Leivänpaahdin. VHS-soitin. Kuuma vesi. Majoitus yksinoikeutta. Oma kylpyhuone. Kirjasto useilla kielillä. Stereo CD. VAPAA WFI. Terassikalusteet. DVD-soitin. Kirja väittää. Microwave. Kylpyhuone suihkulla. Ei lemmikkejä. We hadden gedurende de maand maart 2018 een verblijf in Fataga dat schitterend was. Het huisje was perfect in orde met alles wat we nodig hadden en gelegen in een rustige buurt ver van de drukte van de costa's. My partner and I had a lovely stay in this fantastic property set in the mountains of Gran Canaria. The property was just as shown in the photos and included everything you needed to self-cater for our weeks stay. 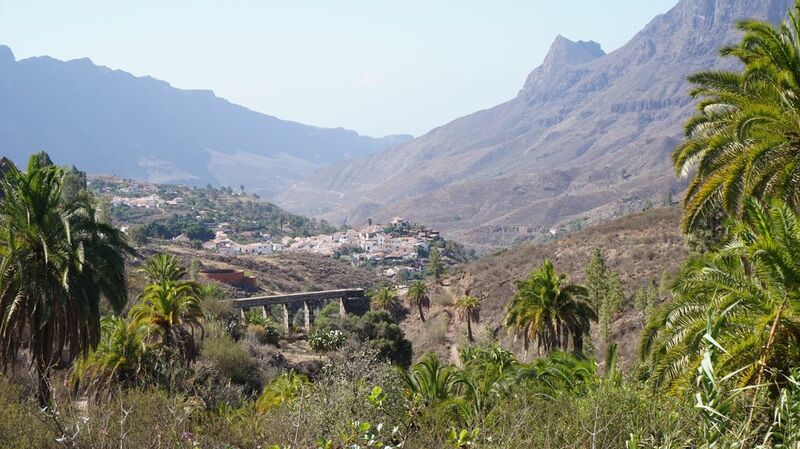 Both the owners of the property and the local residents are friendly and helpful, even with our limited Spanish and their limited English we managed just fine. The almond biscuits from the bakery in the village are to die for. The scenery is stunning and the property was ideally situated for trips either to the North or South of the Island. You do need nerves of steel at first on the road in as it is very bendy, but by the end of the week we got the hang of it. We would highly recommend a stay at this property and a visit to the area especially if you are into walking or cycling. Thank you to Blanca and Alfodo for letting us stay in such a lovely place. Alt i orden og fantastiske omgivelser. Dog savnede vi at kunne sidde i solen. Aldolfo and Blanca were lovely. They made us very welcome. The fresh fruit from their garden and one of Adolfo's pictures to bring home were very special. The house was beautifully equipped and decorated, spotlessly clean and very comfortable. The only slight drawback at this time of year is that the sun did not reach the courtyard. In the summer we think that would be a blessing. We hope to go back again. Wonderfully located in the picturesque village of Fataga, this spacious and well-appointed holiday house is ideal for those wishing to get away from the hustle and bustle of the coastal resorts of Maspalomas et al., whilst at the same time being only a 20 minutes or so drive away from the chance of a salty dip, should the urge arise. The surrounding hills and countryside offer the opportunity for rambling, hiking or cycling, whilst the village itself has everything you need should you wish to stay put – convenience stores, eateries, gift shops and even a petrol station. Although we were late for the appointed key hand-over due to issues with our hire car, a quick phone call to the contact number provided meant that we were unpacking the car a few minutes later. On entry, we were touched to see the table full of welcoming gifts – sweets, fruit and wine, the warmth of which was equalled, if not topped by a visit from the owner himself, who handed us not only another bag of wonderfully zesty fruits from the garden, but also a beautiful, hand-painted print fashioned from his own hands. The communication with the owners worked without a hitch, despite our total lack of Spanish - even the minor issue of a broken light bulb was fixed on the same evening after it had been reported. We had a brilliantly relaxing holiday in this highly recommendable holiday rent, which has everything you need for your stay, including the all-important opportunity to eat outside in the cosy enclosed courtyard at the front of the property. Sun, scenery, sand, sea - enjoy! Es ist eine gemütliche und saubere Ferienwohnung. Plueblo sijaitsee vuoristossa 600m korkeudessa lounaisosassa saaren, 340 päivää auringonpaistetta vuodessa, paratiisi maan päällä.